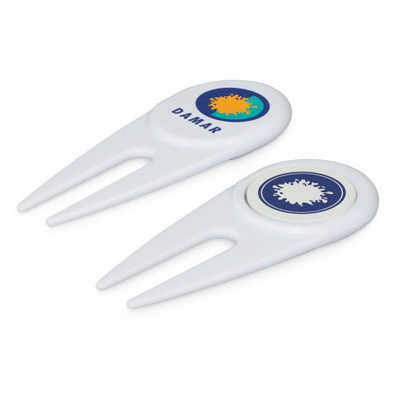 Plastic divot repairer with a metal golf ball marker which is securely held in place with a strong magnet. Colours: White/Grey. Dimension: W 30mm x L 75mm x 6mm. Print Description: Divot repairer - 22mm circle. Print Type: Pad Print. Packing: Loose packed. . Price includes : 1 Col 1 Pos Print. Setup is included.